Artist Amador Vallina has a hard time to part with his works. "It was like a sign for me." As a little boy Amador Vallina found a guitar on the street. Since he wanted to become a musician, this couldn't have been a coincident. Though as he clumsily - the instrument on his lap - plucked the strings, a neighbor saw him and jeered: "You are holding the guitar like a frying-pan!" And his dream of a music career burst. Amador has to laugh reminiscing this little episode, because now he knows that his vocation was a different one. Cautiously, the 52year old scrapes off bark off a palm tree in his studio in Palmas old town. A find from his ramble through nature. At the sea or in the mountains he discovers shells, bones, stones or as well peaces of wood that he puts together to sculptures or applies them to his canvases in order to berth new life into them: "I get the initial impulse from a matter that is dead already, so to say, got over and done with the process." The desire, to give new life to things in a different form, spins through the asturians work like a golden threat, which beginning can be found in marionettes, that were built by Amador in elaborate handicraft. He is convinced: "The marionette led me to the sculpture." He describes his artwork as being informal, abstract: Sometimes you can still tell what the original objects have been before, for the most part though he invents something completely new. Amador only uses "poor material" - as he likes to refer to them - so mostly natural objects or remainders. Where others can only see a piece of trash he sees a jewel. His sculptures, paintings and monotypes mirror all the shades of earth colors. Or they also can be black, grey. Cole is another material that he uses noticeably often. His Partner Ditta assumes that he wants to capture the atmosphere of his childhood in Asturias. Close to his hometown there are many coal basins. Amador left Astutrias behind a long time ago - at the age of 16 he moved to Germany. Nowadays he commutes between Mainz and Palma. He doesn't want do without Majorca again. "I precious the personal atmosphere, it allows me to work very relaxed." With zeal he hurls himself into every new project, improves on details for months, struggles finding the point of finishing. "The work process is almost like an intimate situation for me, I am in my own world - intuition leads me. At the end I always produce something very own and it is not easy to part from them." 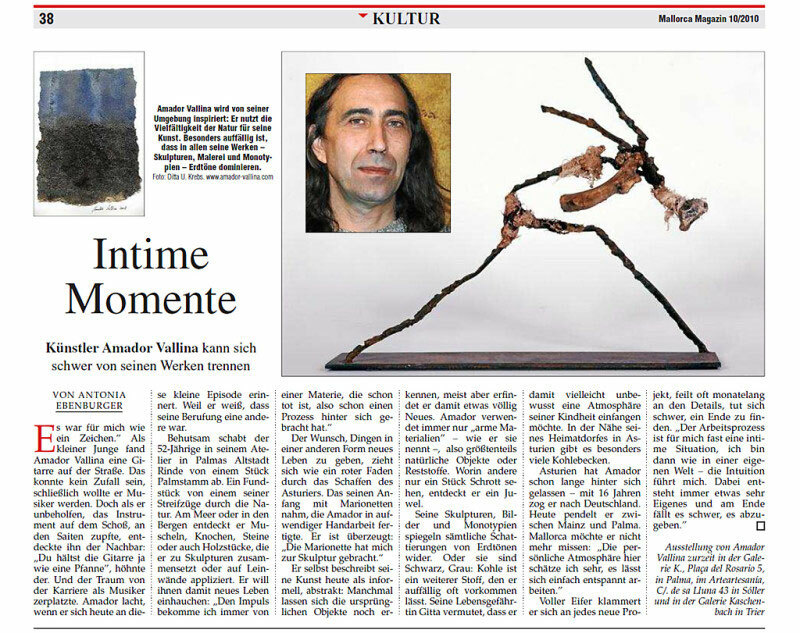 Current exhibition by Amador Vallina in Galeria K, Plaza del Rosario 5, Palma de Mallorca, in ArteArtesanía, C/. de sa Lluna 43 in Sóller, Spain and in Galerie Kaschenbach in Trier, Germany.